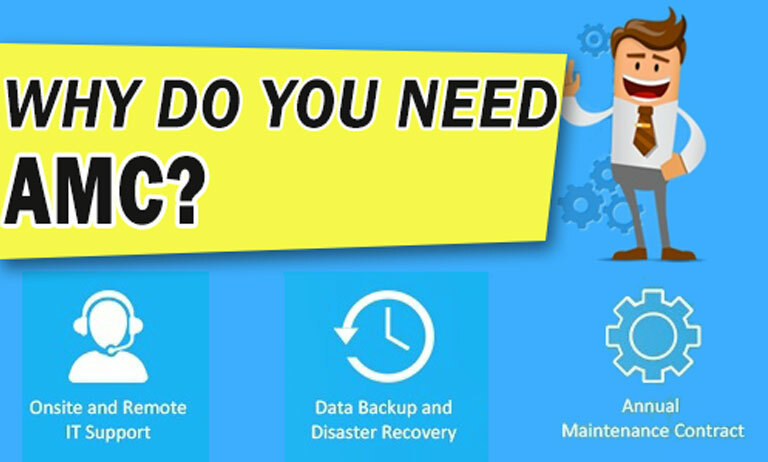 Why Do You Need AMC? The computer is an essential part of many people's life. Today more than 4 billion people are using a computer. A computer is used for various purpose like study, work as well as entertainment. The computer is a great way to communicate with the world. That's why the use of a computer these days has become crucial. We need computer work efficiently all the time. however, the computer is an electronic device. It gets damaged without giving any notice like all other devices. And these problems can be anything, from a virus in the software to a fault in hardware. The best solution with this problem is to make an Annual Maintenance Contract or AMC from a professional computer maintenance service provider. AMC stands for Annual Maintenance Contract. It provides security for all IT services and computer equipment like a printer, desktop, etc. AMC is an agreement between a firm, who provide maintenance and a consumer who has purchased a service. Every firm has a different duration of the service plan. Generally, it lasts from 1 to 3 years. Hardware AMC is a particularly made AMC only for your hardware devices. If you are looking for a company providing hardware AMC services you can approach PAIT Biz Systems. Again it depends on a customer need. Based on customer/organization need, companies make packages of AMC for the amount of service being offered. Most of AMC's include IT network report, status report, inventory management, resolution of inquiries, equipment management, system configuration, etc. Money Saving - Once you made a contract and paid a one-time fee then no matter how many time your computer fails, you no need to pay anything. So every time you would not be paying for your computer repair, you are saving lots of money. Expert Service - Since you have made an AMC you would get service from expert and professional technicians without spending lots of money. This is the biggest advantage of it. PAIT biz systems also provide professional computer repair and hardware AMC in Pune and all major cities in India. Comprehensive Services - There are some companies they offer Software and Hardware AMC. They provide you all the services you need to maintain your computer in a proper way. Why Choose PAIT Biz Systems For Hardware AMC? P A IT Biz Systems Pvt. Ltd. is the topmost company providing Hardware AMC service from individuals to corporates. PAIT's Hardware AMC carry regular maintenance to ensure that all your devices are in optimal working conditions. PAIT ha dedicated team of experts and technicians worked with all brands of servers, laptops, and desktops & all other computer accessories. We at PAIT provide cost-effective services for all of your software and software problems. P A IT Biz Systems also provides a solution for retail shop software. It provides billing software for a retail shop, which can help you to retain customer's using retail billing software.